During the 18th century, sailors in the Bahamas liked to set anchor in deep, circular patches of dark blue water that they nicknamed “blue holes.” A couple centuries later, scientists discovered that these holes actually mark the entrance to underwater caves. Certified scuba diver and biogeochemist Stephanie Schwabe, founder of the Rob Palmer Blue Holes Foundation based in the Bahamas, thinks the term “blue holes” is in need of an update. She would like to see the caves defined by the processes that form them — something that she’s been studying since she explored her first underwater cave in 1992. 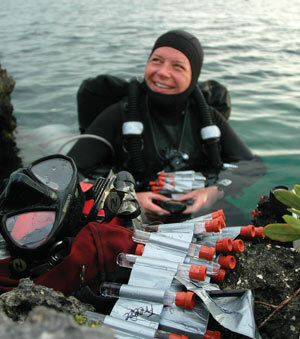 Schwabe began diving after she took a scuba class on a whim while she was an undergraduate student studying geology. But it wasn’t until graduate school that she merged the two passions. Since then, her work has been featured in several television documentaries as well as in a book called Women of Discovery by Milbry Polk and Mary Tiegreen. Schwabe began her foundation — named for her late husband, an explorer and author who introduced her to underwater caves — to educate people about the caves and encourage their conservation. To help with this latter goal, Schwabe earned a degree in international environmental law in 2003. Schwabe recently spoke with Geotimes reporter Erin Wayman about her love of underwater caves and what she’s learned over the years. EW: When did you explore your first underwater cave? SS: About a year after I started [scuba diving]. We had been doing open water assessments in Branford Spring in Florida. It wasn’t a cave dive trip, but there was a hole. I was curious, so I made short ventures into the caverns. I think what really drove it forward was when I started my graduate degree at Mississippi State. I read a book on my advisor’s shelf called Blue Holes of the Bahamas. It was written by my late husband Robert Palmer. At that point, I didn’t look at the book and think, “Oh, I’m going to marry that guy.” [Laughs]. But I thought that the answers I was looking for in the work that I was doing in the dry caves of San Salvador [in the Bahamas] were in the flooded caves. So, I needed to figure out how to get into them. When I gave a presentation on my master’s work in San Salvador, who should be on the island but Robert Palmer. I set off to meet him and he turned out to be an incredibly charming man. We went caving and he asked me if I wanted to join him on an excursion to Andros Island. Naturally, I said yes. I lied through my teeth when he asked me if I was an experienced cave diver. But I got to see burial sites and a beautiful cave. I fell in love with the blue holes of the Bahamas and my late husband. EW: From a scientific point of view, why are these caves interesting? SS: Because they are, for the most part, areas on this planet that no human has ever seen. They are isolated places where the biology has not really changed. We’re finding new species of invertebrates, bacteria, small fish. It’s a portal into the past. EW: You’ve also written about “black holes.” What are they? SS: The black hole actually has a reason for being black. That’s a microbial signature. My late husband assumed by the color that they were very deep. When I actually got [to one] a few months after he died, I discovered that at 17.8 meters — almost in the middle of the water column — there’s a layer of bacteria so dense that no light gets through. EW: Do you know how underwater caves form? SS: I’m 99.9 percent sure [the answer is] by bacteria. The old idea is that caves form from acidified rain that starts dissolving away the rocks and then, boom, all of the sudden we have caves. The problem is if you take this rainwater and collect it, it has a pH of about 5 — certainly this is true on San Salvador — and when you pour it over some limestone within three minutes it’s buffered up to [a pH of] 8. Anything with a pH over 7 isn’t going to dissolve anything. So you have to ask yourself what’s going to keep the water acidified enough to make the trip through the rock? We have determined it’s lots and lots of bacteria [that live in the rocks and produce acids]. EW: What’s it like to be in a “blue hole”? SS: You feel like the clutter of the surface is gone. It’s quiet, almost like arriving on another planet. You forget who you are because there is nothing like you in there.